The following descriptions outline methods for describing and analyzing soils. The initial step is selecting site and making a soil pit. 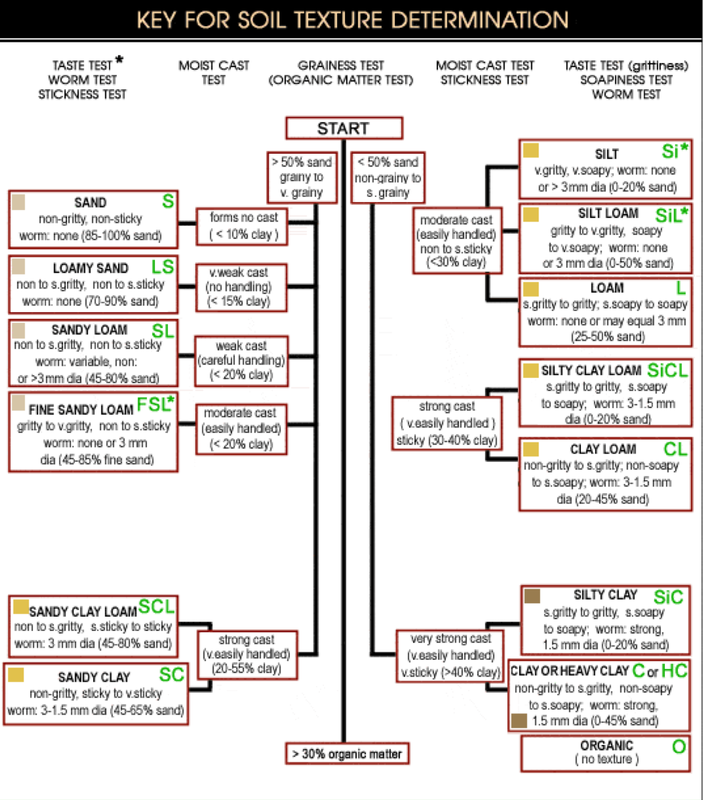 The next steps, outlined below, describe what information is typically collected in a soil pit and how analysis of the information helps in understanding various soil uses and dynamics. Making a soil pit: Identifying and describing the study area involves three steps. Find the location of soil study area. Stand next to the soil pit and use your GPS to create a waypoint for the location of your soil pit. This will give both elevation and longitude and latitude for your site. Find the slope of the soil study area. Take a photograph of the soil study area and the soil profile. The soil profile should be facing the sun. Place a metre stick inside the soil pit beside the soil profile to show scale. Stand outside the soil pit with your back to the sun, facing the soil face. Make sure your shadow doesn’t block part of the picture of the soil profile. Take pictures of the soil profile and the surrounding area. Pit Method: Students dig a soil pit approximately 1 meter deep (or until an impenetrable layer is reached) and as big around as is necessary to easily observe all of the soil horizons from the bottom to the top of the pit (approximately 1.5 x 1.5 m wide). 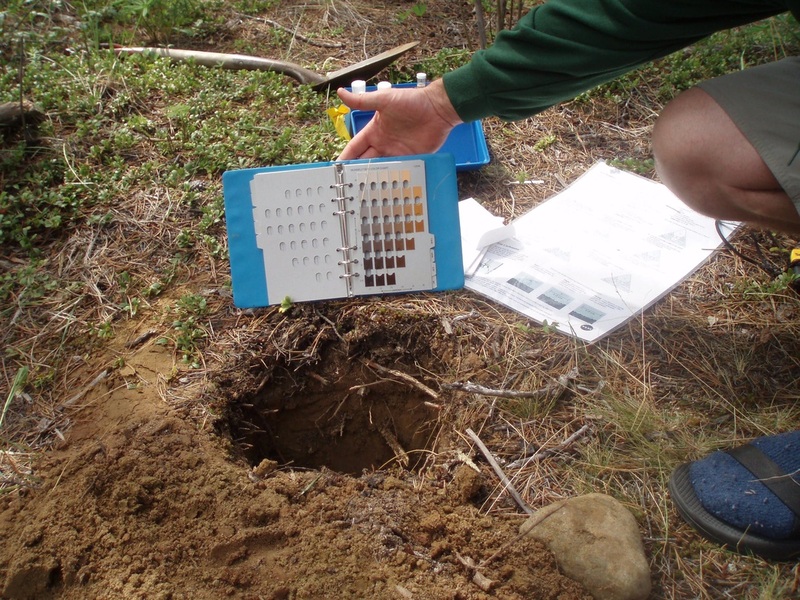 In some situations, students may be able to perform the soil characterization measurements at a site where the soil profile has already been exposed through human or natural action (e.g., a road cut or the side of a ravine). In these instances, teachers need to make sure that the site is safe for students and there is no objection to them scraping the surface soil away to expose a fresh soil face. Digging is much easier when the soil is moist. If possible, plan digging shortly after a rain. As soil is removed from the pit, place it carefully in piles representing each of the natural layers as they occur in the profile. The removed soil can be put on a tarp or other type of plastic sheet to make cleaning up the site easier. Cover piles of removed soil with plastic to prevent them from eroding away. 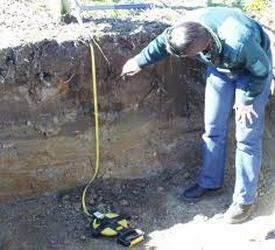 Contact a local soil scientist or other professional who may be willing to assist you in digging a pit and helping describe the characteristics of the soil profile. When finished with the soil characterization measurements, the horizons need to be replaced into the soil pit in reverse order (last one out should be first one back in). Give the site a name or number. Record this on the Soil Characterization Sheet. Determine and record the location of the pit.. Describe the arae including the slope and aspect of the soil pit area. Describe and record the cover type of the site (Bare Soil, Rocks, Grass, Shrubs, Trees, or Other). Describe and record the type of parent material from which the soil was formed at the site (Bedrock, Organic Material, Construction Material, Marine, Lake, Stream, Wind, Glaciers, Volcanoes, Loose Materials on Slope moved by gravity, or Other). Use a trowel to scrape a few centimeters of soil off of the profile to expose a fresh soil face. Determine whether the soil profile is moist, wet, or dry. If the soil profile is dry, moisten it with the spray mist bottle. Start at the top of the profile and observe the characteristics of the soil moving towards the bottom of the profile. Mark each layer ( use a nail or golf tee) at the top and bottom of each horizon. Be sure there is a consensus regarding the definition of the layer boundaries. Look carefully at the soil profile for distinguishing characteristics such as color, texture, shapes, roots, rocks, small dark nodules (called concretions), worms, small animals, insects, and worm channels. These observations will help to define the horizons. Measure the top and bottom depth of each horizon beginning at the top (surface) of the profile. Start with the meter stick or tape measure at 0 cm at the top of the profile. Note the depths at which each horizon starts and ends. Record the top and bottom depth of each horizon. Categorize each horizon on the basis of the definitions outlined below. O) Organic matter. Litter layer of plant residues in relatively undecomposed form. A) Surface soil.Layer of mineral soil with most organic matter accumulation and life within the soil. This layer eluviates (is depleted of) iron, clay and alunimum, organic compounds, and other soluble constituents. When eluviation is pronounced, a lighter colored "E" subsurface soil horizon is apparent at the base of the "A" horizon. A-horizons may also be the result of a combination of soil bioturbation and surface processes that winnow fine particles from biologically mounded topsoil. In this case, the A-horizon is regarded as a "biomantle". B) Subsoil This layer accumulates iron, clay, aluminum and organic compounds, a process referred to as illuviation. These layers may also be divided into multiple layers. They would be refered to as B1,B2,and B3 respectively. Single grained like beach sand. Soil broken into individual particles, Always loose in consistency. Small lumps like sugar or larger. Less than .5 cm in diameter. Common where roots are growing. Big lumps. Irregular blocks usually 1.5 to 5 cm in diameter. Tall columns of soil, roughly circular in shape with rounded top. Found in arid soils. Solid lump with no structure, hard to break apart. Identification of soil colour. Soil colour indicates the types of minerals found in a soil and indicates how soils were formed. To identify the soil colour take an undisturbed soil ped in your hand. Carefully break open the ped. If the soil is dry, carefully moisten the inside surface with a spray of water. Place the sample in a small plastic bag. Keep the soil sample in the sunlight. Look carefully at the colours on the soil colour chart on the back and compare them with your soil to decide the colour of your soil. Record your first and second choices for soil colour. Consistence Consistence relates to the firmness of the individual peds and how easily they break apart. The amount of each sized particle (sand, silt or clay) in the soil is termed soil texture. To find soil texture, we use a graduated set of sieves and the following procedure. pour about 500 ml of dry soil into the course and fine gravel sieves with the solid section on the bottom. shake the sieves to sort the materials by size. Save the finer material. Weigh the finer material. restack the sieves so sand then silt then the solid section on the bottom. pour the materials from each sieve tray into a baggie then weigh the materials. This will give the proportional weights of sand silt and clay. using this proportion and the chart to the right, determine the soil texture. note: the finer the soil material the greater the amount the soil will retain, the slower it drains and the more it moves with freeze and thaw cycles. pH Measurements: pH of the soil affects the activity of the chemical elements in the soil, and so affects many soil properties. The following field method is used to determine soil pH. take a sample of soil that will fit into the a small baggie and add distilled water until a slurry is formed. twist and then squeeze the filter cup until a few drops of water are formed on a clean surface. Carbonates in SoilsCarbonates are materials that coat soil particles in soils that are above pH 7, especially in arid or semi-arid climates. Limestone and other materials with high calcium carbonate contents tend to buffer( neutralize) pH. The field test for calcium carbonate is to put drops of a mild solution of an acid (.5M HCl) on the material. If it contains calcium carbonate, bubbles will form. Soil acts like a sponge spread across the land surface. It absorbs rain and snowmelt, slows run-off and helps to control flooding. The absorbed water is held on soil particle surfaces and in pore spaces between particles. This water is available for use by plants during times of little precipitation. Some of this water evaporates back into the air; some drains through the soil into groundwater. 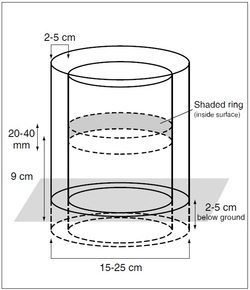 Weight change method: A coarse sieved soil sample is placed in a container and weighed, The sample is then dried and weighed a second time, The weight change indicates the amount of water stored in the soil. The ratio of water to dry soil is called the soil water content. Infiltration rate: The soil infiltration rate is determined by measuring the time it takes for water sitting on a soil to drop a fixed distance. This rate changes with time as the soil pore spaces fill with water. There are three flow rates. Unsaturated flow is the initial flow rate and is high as the dry soil pore spaces fill with water. Saturated flow is a steady flow rate that occurs as water moves into the soil at a rate determined by soil texture and structure. Ponding is the flow rate that occurs when the ground becomes totally saturated and is no longer able to conduct water through its pores.Soil infiltration rate is a measure of the rate at which soil is able to absorb water. It is measured in millimeters per hour. The rate decreases as the soil becomes saturated. If the precipitation rate exceeds the infiltration rate, runoff will usually occur unless there is some physical barrier. Infiltration rate is determined by measuring the time it takes for water sitting on a soil to drop a fixed distance. This rate changes with time as the soil pore spaces fill with water. There are three flow rates. Unsaturated flow is the initial flow rate and is high as the dry soil pore spaces fill with water. Saturated flow is a steady flow rate that occurs as water moves into the soil at a rate determined by soil texture and structure. Ponding is the flow rate that occurs when the ground becomes totally saturated and is no longer able to conduct water through its pores. Using the two cans provided, measure and record the width of your reference band (in mm). Measure and record the diameters of the inner and outer cans (in cm). Pour water into both rings. Maintain a level in the outer ring approximately equal to the level in the inner ring. Note that the water level in the outer ring tends to drop more quickly than that of the inner ring. Pour water to just above the upper reference band in the inner ring,. If the outer ring is leaking water to the surface around its rim start over in another location, push the outer ring deeper into the soil or pack mud around its base. As the water level in the inner ring reaches the upper reference mark, start the stop watch. This is your start time. Record this time. During the timing interval, keep the water level in the outer ring approximately equal to the level in the inner ring, but be careful not to pour water into the inner ring or to let either ring go dry. Stop the stop watch when the water reaches the lower reference mark. Record the time interval. Repeat the process 4 to 5 times or until two time interval are within 10 se. Some clays and compacted soils will be impervious to water infiltration and your water level will hardly drop at all within a 45-minute time period. In this case, record the depth of water change, if any, to the nearest mm. Remove the rings. Wait five minutes then take a soil sample from where rings were removed. Measure the soil moisture through the process of weighing first, drying, then measuring again.